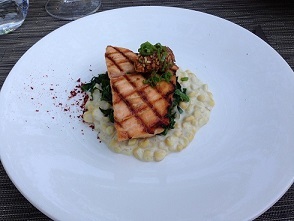 No trip to Napa Valley is complete without at least one meal at Solbar. Nestled in the Solage resort in Calistoga, Solbar is close to Araujo, Aubert, Chateau Montelena and Peter Michael, among others, making it a convenient stop before or after a tasting. I usually sneak in a quick lunch between appointments, but have also had a number of terrific, more relaxed lunches and dinners here over the years. The menu is divided into lighter, healthier choices and heartier dishes. I am a big fan of the spicy shrimp lettuce wraps and the Petrale sole tacos, both of which are on the lunch menu. From the lounge menu, the pizzas are not to be missed. 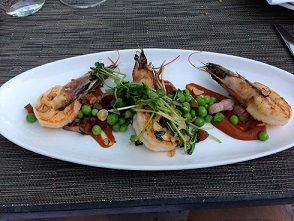 On my most recent visit, the Paprika Gulf Shrimp and Loch Duart Salmon were both delicious. A wine list full of carefully chosen boutique wines offers something for everyone, even the most fanatical wine lover. A number of wines are offered by glass and carafe from the restaurant’s keg system. I know I am old-fashioned, but I like seeing the label on the bottle, just looking at a carafe is something I need to get used to, as I miss the visuals. Still, this eco-friendly initiative is commendable for obvious reasons. 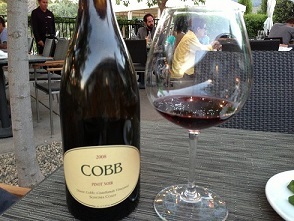 Last week, a bottle of Ross Cobb’s 2008 Pinot Noir Diane Cobb: Coastland’s Vineyard was striking. I loved the weightless fruit and the wine’s expressive, perfumed personality. The signs of smoke taint, such an issue in this vintage, weren’t at all obvious or present, although I did note that the wine shut down with air, so perhaps the two are connected. A few weeks earlier, my wife and I enjoyed Steve Matthiasson’s 2010 White Wine, a Friuli-inspired blend of Sauvignon Blanc, Ribolla Gialla, Semillon and Tocai Friulano, which was gorgeous and beautifully textured, not to mention totally delicious with the food.